In 2004, the Drum Corps International World Championships returned to Denver for the first time since 1978, hosted in the city’s three-year-old INVESCO Field at Mile High (now Sports Authority Field at Mile High). 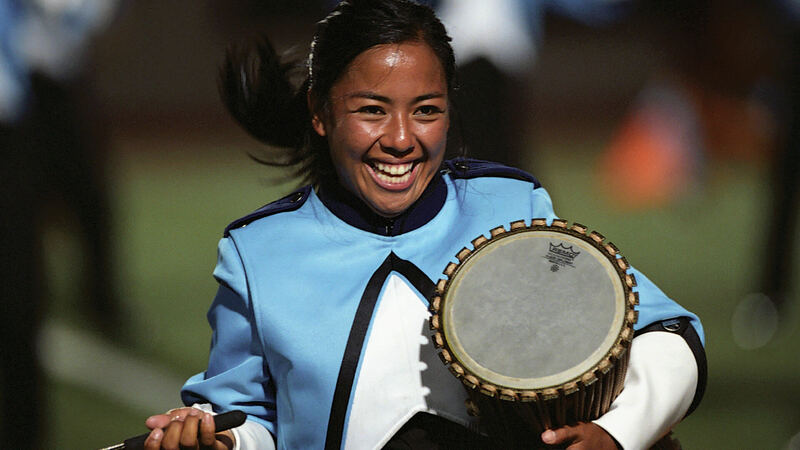 In a series of rules changes, 2004 was the year that amplification in the front ensemble was allowed and also the year a second percussion judge was added. The addition of the new judge resulted in scores being carried out to three decimal places. While the fan-focus may have been on the Cavaliers’ 0.175-point win over Blue Devils for the title, it’s arguable that Glassmen’s 0.075 spread over Spirit from Jacksonville State University might have been decided on the sheets due to the scoring change. Whatever the reason, 13th-place Spirit came about as close as possible to being a finalist, with less than a tenth of a point keeping the corps from its 15th appearance in the final show of the season. Spirit’s “The Architecture of Life” explored the development of the brain, inspired by elements of life that cooperate to push one forward and elements of life that conspire to hold one back. Both these components interacted with one another to create the architecture of ideas, not unlike how physical materials interact to create the architecture of buildings. Four “scapes” of life, conceptual and real, were based on the arrangements and original compositions of Richard Saucedo, who at the time was also arranging for the Cavaliers. The show opened with “Mindscape,” a Saucedo original inspired by J.S. Bach’s famous “Jesu, Joy of Man’s Desiring,” written in the early 1700s as the last movement of a 10-part cantata. Bach’s work, heard solely in the front ensemble, quickly evolved into the Saucedo piece, which was introduced by a series of repetitive brass pulsations interrupting the Bach. The intent of the piece was to explore the differences between the left and right sides of the brain, utilizing contrasting musical styles to emphasize the brain’s contrary analytical and creative sides. Each side continually fought the other for supremacy, heard in the music that had short brass outbursts interrupting smoother passages, while drill forms of continuous angles and arcs evolved amidst formless pods of other brass. The formerly gentle Bach melody returned as a forceful and dynamic fanfare statement that brought the opener to a close. Next was “Dreamscape,” starting with the mallet keyboards playing the 1868 piece written by Johannes Brahms that has come to be known as “Brahms’ Lullaby.” This segued into the gentle chorale segment from Ron Nelson’s “Sonoran Desert Holiday,” written to convey the mood of the dry and hot desert that stretches across southern parts of California and southwest Arizona, as well as the region of Mexico around the Sea of Cortez. The elusiveness of dreams was highlighted by a wide variety of ethereal metallic sounds up front and wafting brass chords played to the back of the field. The music seemed to express the beauty of the idyllic sunset that was reflected in the red, yellow, and orange arcs of the flags. “Soundscape” was the other Saucedo original in the show; unusual in that to further explore the two sides of the brain, percussionists largely performed melodies while the horns emphasized rhythm. Many of the color guard members spun implements in the shape of a curvy sine wave that physically divided the competing hemispheres of the brain. The wooden instruments in the front ensemble repeated an angular series of schizophrenic notes, followed by a powerful blast of brass that attempted to push all other musical stimuli off the field. During the climax, fluorescent pink flags were unveiled up front to a visually jarring effect. “Urbanscape” personified life in the big city with two different musical selections, one accentuating the cityscape of a half-century earlier, the other the cityscape of contemporary times. Leonard Bernstein’s main theme from the 1944 stage musical “On the Town” conjured up memories of the city during the optimistic mid-century. Members of the front ensemble percussion section fervently attempted to hail the taxis that were heard through the beeping of a variety of horns. Members of the color guard held up signs proclaiming “TAXI,” as well as signs identifying other forms of city transportation. A drum break led into the second work featured in “Urbanscape,” Michael Daugherty’s quirky “Bizarro,” written in 1993 and based on the Superman foe created by Lex Luthor’s duplicating ray. Bizarro was a wacky punk version of Superman, accented by Daugherty with three rock drummers and a melodic line that seemed to spill in all directions at once. Spirit utilized this spinning-out-of-control work to convey the fast-paced lifestyles of contemporary city dwellers. The show came to a conclusion with a recap of melodic clips from both the Bernstein and J.S. Bach pieces, spanning the centuries as well as the lobes of the human brain. For this week only, you can save on the DVD that contains this complete Spirit from JSU performance, along with all corps from the 2004 DCI Division I, Volume II disc. Buy the 2004 Division I World Championships DVD. Discount DVD offer ends Monday, October 26, 2014.